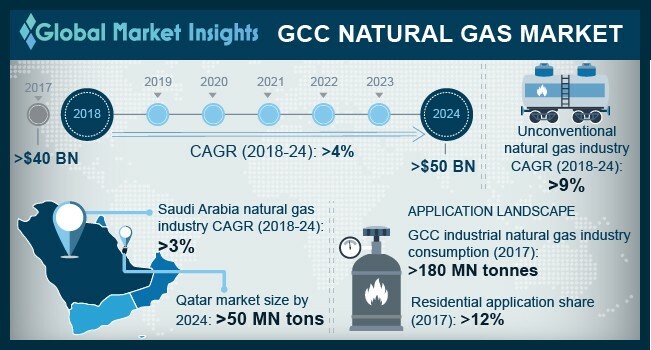 GCC Natural Gas Market size will surpass USD 50 Billion by 2024, as reported in the latest study by Global Market Insights, Inc. Rising concern to maintain fossil fuel sustainability along with stringent regulations to reduce environmental impact will drive the GCC natural gas market size. For instance, in November 2016 Saudi Arabia signed Intended Nationally Determined Contribution and Paris agreement which aims to reduce 130 Mt of CO2 annually by 2030. Increasing need to suffice demand for electricity from high energy intensive industries will propel the GCC natural gas market size. Ability to offer cost effectiveness, environmental proximity and low electricity generation cost will make its adoption preferable over other alternates. For instance, as per BP energy outlook, total energy utilization in GCC region is anticipated to witness growth over 50% by 2040, where natural gas is projected to gain over 60% escalation. Qatar natural gas market is projected to reach over 50 million tons by 2024. Positive outlook toward liquified natural gas production along with abundant availability of natural gas reserves will enhance the product penetration. For instance, in 2018 government of Qatar announced plans to boost LNG production up by 30% i.e. from 77 MTPA to 100 MTPA by 2023. Unconventional natural gas market is anticipated to witness growth over 9% by 2024. Growing demand for clean fuel from power plant and water desalination industry will stimulate the industry landscape. Ability to offer greater efficiency, less carbon emissions and non-toxins are some of the features which will enhance the product penetration across the region. Residential application in 2017, held over 12% of the GCC natural gas market share on account of expanding middle class population base favored by rapid economic growth. World Bank in 2018 projected a growth over 1.5% in reference to the Saudi Arabian economy. CNG natural gas market size is predicted to exceed USD 3 billion by 2024. Shift in trend toward sustainable resources to reduce environment pollution along with increasing number of automotive vehicles will drive the product demand. For instance, in Saudi Arabia, the sales of passenger cars are anticipated to grow by 50%. UAE natural gas market is projected to witness significant growth owing to positive outlook toward energy diversification. For instance, government of UAE set a target to integrate 24% of renewable resource contribution under the National Agenda 2021. Positive outlook toward development of tight gas and shale reserves with abundant availability of unconventional reserves will fuel the Bahrain natural gas market size. In 2018, operators across Bahrain discovered 80 billion barrels of tight oil in the off-coast region which in turn will positively sway the industry dynamics. Increasing investment towards the development of unconventional natural gas reserves along with growing demand for energy will propel the Saudi Arabia natural gas market share. For instance, Saudi Aramco announced to invest USD 7 billion for the development of shale gas reserves. Major industry participants across GCC natural gas market include Exxon Mobil, Total, Occidental Petroleum Corporation, General Electric, ONGC Videsh, Royal Dutch Shell, Statoil, Petroleum Development Oman, Bahrain Petroleum Company, ConocoPhillips, Qatar Petroleum, Rosneft, GAZPROM, British Petroleum, Lukoil, Eni, Chevron.